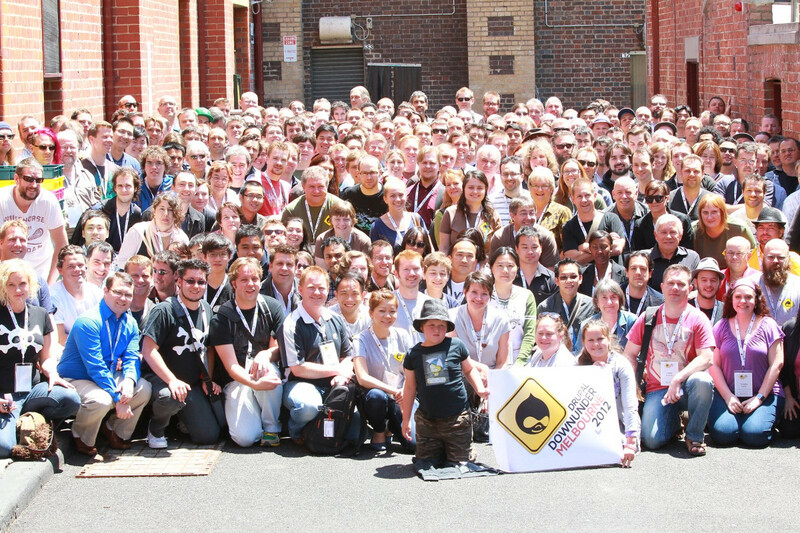 In January 2011, Australia hosted its first major Drupal conference in Brisbane, Queensland. This year, 'Drupal Downunder' (aka DDU) was hosted in Melbourne, Victoria from the 14th-15th of January and (as usual) the Coffs Drupal team attended (Matthew, Ruben and myself). After we arrived at Melbourne airport and collected our luggage, we hopped on the Skybus which conveniently took us from the airport to the city, then on to our apartment. We met up with Ruben (who had travelled down the day before) and went out to find a late dinner. We eventually came across a nice hamburger joint, tucked away in an alley down towards the river, and enjoyed a quiet dinner there. We then had all of Friday to ourselves to explore Melbourne before we could met up with the other conference delegates for drinks at 5pm. We therefore headed our separate ways and agreed to meet later for lunch. I immediately walked a few doors down from our apartment and into Koorong bookstore. I spent almost an hour in there browsing through everything and trying to find some CDs I've been wanting. I only found one CD from my wishlist, but found another I liked and a new Ted Dekker book too. From Koorong I made my way down Elizabeth Street towards the river and into JB Hi-Fi (making full use of all the stores we don't have here in Coffs). There I bought another 3 CDs (none of which were on my wishlist). I then found a few other stores that I browsed through in the hopes of ticking some more items off my list, but in vain. Matthew phoned me once I had exhausted my search and was heading back to the apartment, so after dropping off my shopping we met outside the Sherlock Holmes Inn for lunch. Unfortunately it was quite full and so we instead found a quieter tavern around the corner. After lunch, I headed off by myself to walk around Southbank with my camera. I found the Eureka Tower and got prices for visiting the Skydeck (cheaper than I thought it'd be). I then followed the river down beside the Royal Botanic gardens, up Anderson Street and back through the gardens themselves. 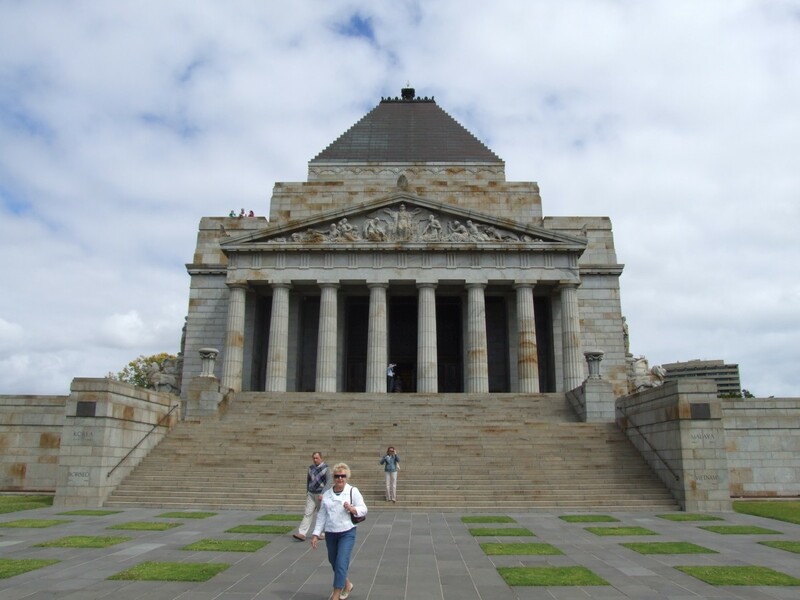 I got some nice photos of the Shrine of Remembrance and eventually worked my way back across the river into the city. We all met up back at the apartment, then headed around the corner to the Jasper Hotel where the conference was being held and where we had all been invited for pre-conference drinks. There we met some old, and new, friends and exhausted ourselves talking about Drupal for two hours. Dinner was a fiasco. I suggested walking down Queen Street as I'd seen some nice cafes along there earlier, however they were all shut. We came across an Irish Pub and, after signing in, realised the restaurant was closed. I suggested I'd find myself dinner elsewhere as Matthew and Ruben were happy to stay at the bar. I therefore went in search of a place that was: open, not crowded/noisy, and didn't just serve Asian food. After walking around the city for almost an hour, I finally came across a nice restaurant/bar on Elizabeth Street on my way back towards the apartment (I'd almost given up and was heading towards a Subway I'd seen earlier). There I had a nice pasta dish for a late dinner. Saturday morning we got up nice and early for the start of the conference. The very first session was a keynote by 16 year-old Dmitri Gaskin, one of Drupal's core contributors. It was amazing to hear such enthusiasm and knowledge from such a young person! Dmitri's keynote was followed by morning tea. The next two sessions I attended were on using the Omega theme, and creating custom fields, widgets and formatters. An hour lunch break followed, during which I went for a walk through the city. I had to hurry back in time for Miguel Jacq's 'Aegir' session which was packed! There I finally got to (briefly) meet Tine; a co-worker at NetEngine in Brisbane who I've chatted to on Skype but never actually met. I then attended a session on Drupal Commerce (and how not to use it). Afternoon tea followed. The last two sessions of the day were on scaling Drupal, and a keynote by Gian Wild on accessibility. One of the conference organisers then got up to close the first day of the conference and mentioned some dinner options, one of which was Lygon Street - a popular food district also known as 'Little Italy'. 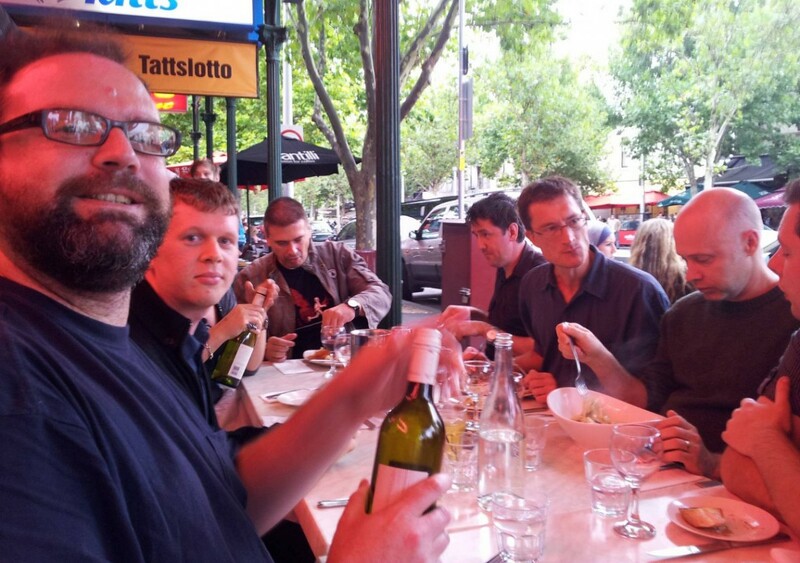 After Friday night's dinner, we had decided to try out Lygon Street as there would be no shortage of restaurants there. On our way back to the apartment from the conference, we found ourselves chatting with Justin, a fellow Drupaller who was staying a few doors down from our room. We mentioned we were heading over to Lygon Street for dinner and so invited him along. The four of us therefore found ourselves in Lygon Street half an hour later, overwhelmed by the plethora of Italian restaurants. As it was our first time there, we were a little taken aback when the owners came out onto the street and tried to convince us to eat in their restaurants, even to the extent of offering us free wine. Matthew and I were leading when we realised we couldn't hear Ruben or Justin behind us any more. We turned around and found them back down the street, having met up with some other Drupallers. They joined our search for dinner and so our band of followers grew. After walking down one side of the street and running out of restaurants, we crossed over and started making our way back down the other side. We eventually came across yet another Italian restaurant owner who started trying to convince us to stay and eat (free wine, etc.). We were basically all standing around, not able to collectively make a decision, when Ruben shouted that he was hungry and grabbed a seat. The staff quickly started arranging tables for us into one long table on the footpath as (when I counted later) there were 17 of us in total. I found myself sitting next to Tine so was able to have a good chat to her over dinner about work, etc. I had a very nice steak with prawns and veggies, others ordering pizza and pasta (I didn't want pasta two nights running). While we were all sitting chatting, we somehow managed to convince the staff we had been promised more complimentary wine and garlic bread (though the owner didn't object). All in all I had a lovely time sharing dinner with a bunch of strangers, all discussing our love of Drupal. This was one the the highlights of my trip. Thankfully, the driver had to go back down to the river before stopping for the night so I was able to get off where I had originally planned. By this time though it was 9:30pm and I only had half an hour to cross the river and visit the tower before they closed. I therefore decided to try tomorrow night instead. As I was too scared of catching another tram and having it leave me out in the middle of nowhere, I did have to walk back to the apartment after all. It was good exercise though. Sunday morning and the second day of the conference. The first session was Dries Buytaert's keynote about Drupal and where he believes it is heading (in regards to small, medium or enterprise business - thankfully it looks like Drupal will better service all three). As Dries finished his presentation early, he had time for questions from the audience. It was good to hear the questions people had for Drupal's founder and his answers to them. That was one of the things I missed from DDU 2011 - a Q&A session with all the keynote speakers. Dries' Q&A was a good compromise. Morning tea followed where we had Drupal cupcakes to celebrate Drupal's 11th birthday! After that was one of my favourite sessions titled 'Small is Beautiful'. It discussed a business that sounded very much like the one I'm planning to start and how they used Drupal to build websites for only small businesses/clients. I then attended an informative session on building Drupal distributions (again relating to my future business). Before lunch, the conference organisers wanted us all outside to take the traditional group photo. All 240 delegates therefore made our way outside, across the road and down an alley where we huddled together and smiled for the camera. It was then back inside for lunch. The session I had planned to go to after lunch had been cancelled and so I instead went to an very interesting session on integrating CRM systems with Drupal. The final session was one of my favourites: building an e-commerce website in 25 minutes. As I had just finished building an e-commerce website for a client, this was very entertaining. The presenter, Andrew Yager, was bubbly and energetic, almost to the point of literally bouncing around the stage. That in itself is why I found this last session to be another of my favourites - informative entertainment. Afternoon tea was next, followed by the final gathering of all delegates for prizes, 'lightning talks' and the wrap-up. The prizes were handed out to everyone who had successfully completed the 'sponsors treasure hunt' on the DDU website prior to the conference. I was one of them and so ended up winning a 'Front End Drupal' book, nice! The lightning talks followed - short, 3-5 minute talks presented by anyone willing to get up and share something Drupally. I loved this part; hearing lots of different ideas and presentations in a short span of time (and counting down anyone who took too long). The conference organisers then got up to officially thank everyone for attending, and to thank all the volunteers who made the conference happen. They then introduced next year's organisers who revealed the location of DDU 2013 - Sydney! Meeting back at the apartment; Matthew, Ruben and I sat and shared notes from the conference (we had generally attended different sessions). Once we got hungry, we headed into the city for dinner. There was a Charles Dickens Tavern somewhere in the CBD that Matthew had heard of and wanted to try, so we went looking and (funnily enough) came across it almost instantly (Matthew must have good eyes). There we had a nice quiet dinner over another post-conference discussion. When we were done, Matthew and Ruben decided to try the Sherlock Holmes Inn again, so I headed off to the Eureka Tower. The sun hadn't set in Melbourne yet, so I walked around the river for a while, taking photos of anything and everything. 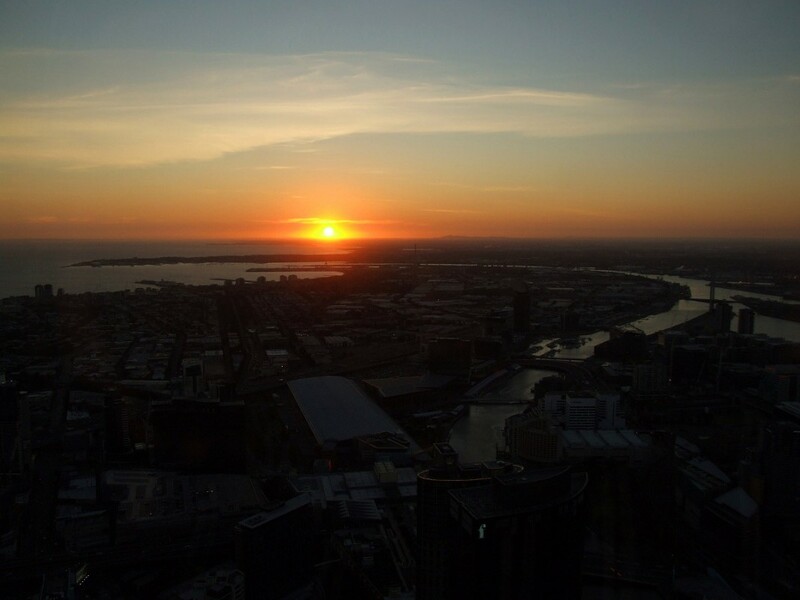 When I figured the sun was getting close to setting, I headed over to the tower and up to the 88th floor where the highest viewing platform in the Southern Hemisphere is located. The views from up there are spectacular! Unfortunately it's mostly indoors so good photos are hard to get (even with your camera lens pressed right up against the glass to reduce any reflections). There is an outside viewing area (which was very windy and cold), and even though it's fully enclosed in a fence I was able to aim my camera between the wires to get some good shots. I saw the sun set over Port Phillip Bay (or thereabouts), then stayed to watch the city lights come on. It was beautiful up there, especially once it was dark. In all, I was up at the Skydeck for about and hour and a half. God must have been up to something because the weather was so much better that night than the previous one. When I finally came down, I browsed through the gift shop looking for a souvenir to take home. I found a nice polo shirt with Eureka Skydeck on it and so bought that (I needed some more nice-fitting shirts). I then shouted myself an ice cream for the walk back to the apartment. The Eureka Skydeck was another highlight of my trip. Monday morning we got up and packed up. Matthew and I were flying out at lunchtime, Ruben later that afternoon. Once we had checked out, Ruben headed off to find the code sprint that the conference organisers had put on for anyone interested in contributing to Drupal, and Matthew and I got the Skybus back to the airport. We had a quick morning tea, then boarded our flight to Sydney. In Sydney we had some time to kill before our connecting flight to Coffs, so we had some lunch (my first Subway of the trip) and browsed through the airport. I spent some time looking through a bookstore/newsagency and found the new Sherlock Holmes book which I had to buy (the first Sherlock Holmes book to be authorised by the Conan Doyle Estate). We then sat and waited for our connecting flight, which (as it turns out) was late. When it finally arrived we boarded and headed home. My trip to Melbourne was an amazing time, both for the Drupal conference and the sightseeing/shopping. I'm really looking forward to next year's Drupal Downunder in Sydney!